Half Day Cairns Town Tour with Hotel Pick Up, Afternoon Tea, Overnight Cairns Accommodation. Spend the day exploring Cairns at your own pace. Perhaps take the famous Kuranda Scenic Railway through the Wet Tropics or the Skyrail Cableway for remarkable views of Cairns, the tablelands, mountain ranges and the Coral Sea before descending through the rainforest canopy. You may also visit the beautiful Daintree Rainforest and Cape Tribulation where the rainforest meets the ocean. Alternatively, you may choose to relax and stroll around the many cafes and shops or the beautiful waterfront in Cairns. The choice is yours.. Begin your 4 day adventure in the Southern Great Barrier Reef this morning. 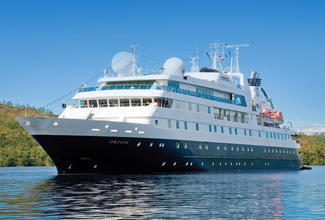 You will be personally met at your Cairns hotel by a DISCOVER AUSTRALIA representative and transferred from your hotel to the Cairn’s Cruise Liner Terminal to board the Coral Expeditions II . Cruise through Trinity Bay as you enjoy views of scenic Port Douglas. Soon you arrive at your first exclusive mooring site. Cruises alternate between Thetford Reef, Coates Reef and Nathan Reef. You may get off the vessel to snorkel or SCUBA Dive or alternatively if you don’t want to get your feet wet you may enjoy a glass bottom boat tour, view a fish feeding display or an onboard presentation by a Marine Biologist. This evening, enjoy welcome sunset drinks on the deserted Sudbury Sand Cay before enjoying a special seafood buffet dinner back on board the Coral Expeditions II. Meet and Greet Personalised Port Transfer, Lunch, Snorkelling, Diving, Glass Bottom Boat Tour, Sunset Drinks, Special Seafood Buffet Dinner, Overnight Accommodation onboard the Coral Expeditions II. Enjoy time on a tropical island where you will enjoy a guided bushwalk, a gourmet Aussie beach BBQ and the chance to snorkel or dive over the island’s fringing reef which showcases a magnificent garden of giant clams. Today, after breakfast, enjoy a rainforest walk on Dunk Island with your naturalist guide. Look for the fabulous electric blue Ulysses butterflies before spending the afternoon exploring the colourful Nathan Reef. You have the opportunity once again to snorkel, SCUBA dive or enjoy a glass bottom boat tour. Experience an interactive marine biology presentation at the onboard display tank. Discover Fitzroy Island this morning. Take beautiful bushwalks and hikes, snorkel over the fringing reef and enjoy beachcombing on the white sand of Nudey Beach as well as the chance to enjoy the resorts facilities. You will return to Cairns this afternoon and you will be personally met at the cruise terminal by a DISCOVER AUSTRALIA representative and transferred to Cairns Airport for your flight home. The 4 Day Great Barrier Reef Southern Expedition Cruise with Cairns Stay is very popular. Many dates book out well in advance, please book soon.